God's rescue plan that unfolded that special night over 2,000 years ago (for it was really begun before the foundation of the world) is what we celebrate at Christmas. God's Son came in flesh to bring forgiveness, restoration, redemption and adoption. To be right with God the judge is a great thing, but to be loved and cared for by God the Father is a greater. 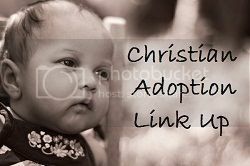 Horizontal adoption (adopting our sweet girl) is a beautiful picture of our vertical adoption brought about by God's rescue plan. You see, our little one was literally rescued last Christmas. She has been in an orphanage for a whole year waiting for her adoption into our family -- her forever family. We have sacrificed to get her. We have done this gladly. And so while we will celebrate Christmas Stateside this year without our sweet girl, we know the day is coming quickly when we will be asked to come adopt her. Our lives will be forever changed. But we will also have to come home without her while final documents are prepared. She will legally be ours, but the reality of her new status as our daughter will not be realized. Yet. The day when she leaves the orphanage, never to return. The day we sweep her up in our arms and bring her home to enjoy all the love of her forever family. Christ's birth over two millennia ago was wonderful, significant, and necessary. He lived the perfect life I could never live. He took God's just wrath over my sin on the cross. He bore that wrath and separation from God so that I don't have to! Now by faith, I look with anticipation to Christmas Future -- that "gotcha day" when the reality of my spiritual adoption and position as a daughter of the King will be fully known and enjoyed. Do you have some kids on your gift list that just don't need another toy? Or maybe there will be some littles at your Thanksgiving get-together that need something to keep them busy while the grown-ups tend to the turkey. Whatever the case, I have a super simple DIY button craft kit to show you! It provides hours of creative fun. How do I know? It's been kid-tested at my house four times over. I bought this one used since it's not in print anymore. Then dump out that button jar, or buy a stash on amazon (affiliate link again!). Grab some paper and white school glue, and you're all set! It really is that simple. The book is fun to read and provides the inspiration. But once kids get the hang of it, the sky's the limit to the creative button masterpieces they will make. And if you'd rather not hunt down the supplies yourself, check out my etsy shop for this craft kit! Disclaimer: Please use care in letting children play or craft with buttons. We're still here waiting for our next steps in this adoption journey! It's a huge lesson in patience and waiting for God's perfect timing. We are currently in the middle of step #4! USCIS has received our form and they are conducting the PAIR process. We are now waiting for the PAIR process to be complete and receive our court date! Then we can make arrangements for our first trip to Ethiopia to meet our little one and adopt her there! After that, we will need to come home without her and wait for everything to be finalized for our final trip to bring her home. It's a long process, but totally worth it. Being known, loved, and wanted is so very special, isn't it? So many parallels to God's adoption of me. Our very important papers left Ethiopia on Wednesday and should be on our doorstep in a few hours! Now we can move on to the next steps to get our little miss home. Yay for progress! Five years ago, when God burdened our hearts for a little girl who had yet to be born, another little girl's story inspired us to start our journey.